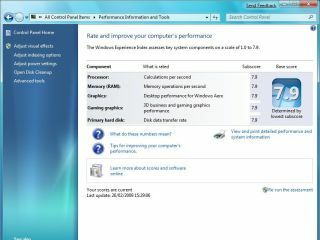 Last week we looked at the hardware the Windows 7 WEI requires to score a magic 7.9, but does the Windows Experience Index have real meaning? As we found out, there are a lot of questions and complaints surrounding it, while others have dismissed it as meaningless. But is this just a typical over-analysis by the tech-savvy or a toy-based throwing action from people stuck in their PC prams? Clearly Microsoft think it's of worth and employs a group of software engineers to develop the Index for Windows 7. The corporation describes the WEI as a way to help you "understand how well Windows Vista and other software will perform on your PC". It's also part of a wider 'performance feedback loop' development to help identify and eliminate performance bottlenecks in conjunction with other reporting tools built into Windows. The issue is whether we and the wider world should describe it as a benchmark. As a benchmark it needs to stand up to many stipulations: it has to be standardised, repeatable, practical, accurate and meaningful. The Index does tick all of those boxes - apart from the final one. Although, it's not enough just to say that as it returns an unexplained number it's therefore meaningless. After all, that could be applied to a host of industry standard benchmarks and with a large enough pool of results, meaning does come from that figure. Similarly, it's not enough to dismiss the score by arguing the test process itself is unknown, again many industry benchmarks don't reveal their inner workings, but it's also easy enough to check for consistency from that large pool of results. All of that doesn't change what people think of the WEI. People feel hard done by or just bemused by it. Why does my top-of-the-range memory only score 4.9? Why does this drive score less than my laptop drive? Without real disclosure of why a device scored a certain level, we're still in the dark. How can the user understand what can be done to improve that score, especially when artificial limits are applied to certain areas? Unfortunately, while Microsoft wants us to understand how well software will run on a system, it does nothing to empower us to fix the problem. The problem is compounded by the overall Base score that's capped at the lowest sub score. We appreciate the notion that a system is no stronger than its weakest component, but take a decent gaming rig with five scoring components. It can be dragged down to a 2.0 just by the rating of its hard drive, yet that wouldn't compromise the enjoyment of the games. That aside, scoring 5.9 across the board isn't too much of a stretch these days. An Intel or AMD quad-core processor is your starting point, or an Intel chip with a 1,333MHz FSB. 2GB of PC2-8500 memory will help and we've found the Western Digital WDxxxxAAKS models to be high scoring drives. For graphics an ATI Radeon 4670 or Nvidia 9600GT are the minimum order of the day. But if you're sick of a low WEI score then the easiest solution is to just hack it. Browse to Windows\Performance\WinSAT\DataStore and edit the latest 'formal' assessment XML file in Notepad.